We are a family owned and operated restaurant, serving Italian American cuisine. We know how important fresh made meals and a comfortable atmosphere is for a relaxing meal! We pride ourselves on a full service menu that offers a variety of breakfast and lunch selections. We also serve our amazing dinner options at our Thursday Community Night Dinners. Each meal is individually prepared and cooked to your liking. With options from the most basic to specialty creations, many of our foods are locally sourced, providing the best flavor option for your meal. Co-owned by Marco Paoletto and Doreen Maglio Zukauskas, our restaurant has become the informal meeting place in town. Just take a look at the menu and you'll see why folks keep coming in. Everything is cooked to order and the portions have everyone leaving full and satisfied. Enjoy our food in the restaurant, take it to go, or let us cater your next event or party. Same great food, same great quality! From 11:00 am - 2:00 pm we offer a special Friday lunch special. Like and follow us on Facebook and see the week's specials. Great friends, great food and great fun! 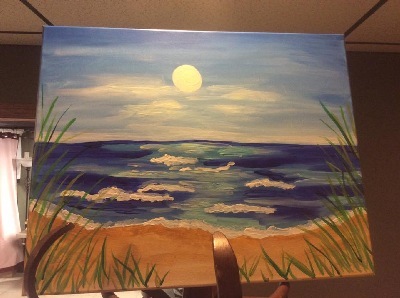 Check out our Paint and Craft Nights! Follow us on Facebook to join the fun! Check out our finished projects! Fall Events Schedule Coming Soon! Thursday night re-open 4:00 - 7:00 for Community Dinners. *These dinners offer a specific menu selection and a portion of all proceeds beneft a local organization.